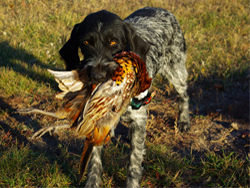 The German Wirehaired Pointer is a well muscled, medium sized hunting dog of distinctive appearance. The coat of the German Wirehaired Pointer is wire-like and has facial furnishings that resemble a mans goatee. 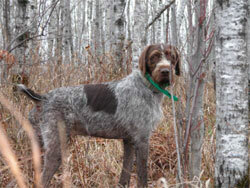 The undercoat is dense enough that while in the winter the German Wirehaired Pointer is insulated against the cold. The outer coat is straight and harsh, wiry and lays flat and is one to two inches in length. The coat protects against the sometimes bitter and rough conditions of hunting. They tend to be a very affectionate, active and eager to learn and are known for being very loyal to its owner and family. They need early socialization and exposure, and some may try to dominate other animals but most will get along with other dogs. The German Wirehaired Pointer is truly a versatile breed with a strong pointing instinct and a love of water.